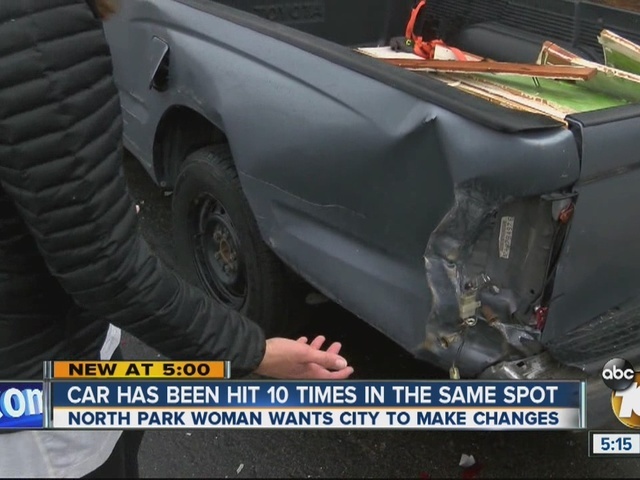 A North Park woman is tired of her cars getting hit in front of her house. It has happened more than 10 times in the past decade. Lisa Bartkowski said she wants the City of San Diego to slow the cars on Boundary Street. Her Toyota Tacoma was smashed by a driver Saturday night. It is the latest in a series of accidents she blamed on poor road design. She said drivers can’t see over a hill leading to her house. She asked the city to decrease the speed limit or add speed bumps. “They say that the speed studies don’t justify any calming measures or lowering the speed limit,” Bartkowski said. A spokeswoman for Councilman Todd Gloria said a staff member is looking into it. In the meantime, Bartkowski said the hit and runs aren’t enough to make her move.